Detroit is "clearly insolvent", the city's emergency manager has said in his first review of Detroit's finances. 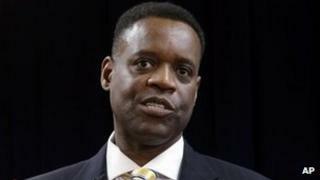 Kevyn Orr, who was appointed in March by the state of Michigan to handle Detroit's finances, said the city's net cash position as of 26 April was negative $162m (£106m). Detroit's finances have deteriorated because of the decline in the car industry, mismanagement and corruption. Mayor of Detroit Dave Bing said his office would review the report. Detroit is the largest city in the US under state control. Mr Orr has the power to override its elected officials, rewrite labour contracts, privatise services and sell assets. The city has been running a deficit for nearly 10 years, struggling under the weight of its pension and health insurance commitments. In March, a former Detroit mayor, Kwame Kilpatrick, was convicted on charges of corruption and bribery. He was found guilty on 24 charges that included racketeering, fraud and collecting kickbacks for city contracts. In his report, Mr Orr said Detroit's expenditures had exceeded revenues from 2008 to 2012 by an average of $100m each year. He added that the budget deficit was expected to reach $386m in less than two months. "The City of Detroit continues to incur expenditures in excess of revenues, despite cost reductions and proceeds from long-term debt issuances," he said. "In other words, Detroit spends more than it takes in - it is clearly insolvent on a cash flow basis." He went on: "The 45-day report I have submitted is a sobering wake-up call about the dire financial straits the city of Detroit faces. No one should underestimate the severity of the financial crisis." He said that years of issuing long-term debt to pay the city's bills could not go on. "The path Detroit has followed for more than 40 years is unsustainable and only a complete restructuring of the city's finances and operations will allow Detroit to regain its footing and return to a path of prosperity." Mr Orr said he would use the report as a baseline for reducing the city's debt and long-term liabilities, saying it had obligations of "at least" $15bn. A restructuring of the police and fire departments; the report says Detroit's "infrastructure and public safety fleet are aged and decrepit"
Mr Orr has previously said that he hopes to avoid a municipal bankruptcy filing but has not ruled one out if necessary. The report was released late on Sunday and submitted to state Treasurer Andy Dillon and Mayor Bing on Monday. In a statement, Mayor Bing said: "A comprehensive review of the emergency manager's financial and operating plan has yet to be conducted.